You must have an endless supplies of photographs to choose from. You always seem to come up with the right ones. I like the Kens and Barbies, never having had them when I was young. I'm sure I missed out on something. Glad they are getting to play on Romeo's Holiday. So festive. I hope they had nice weather all the way through. Great entries for both Solemn and playful! 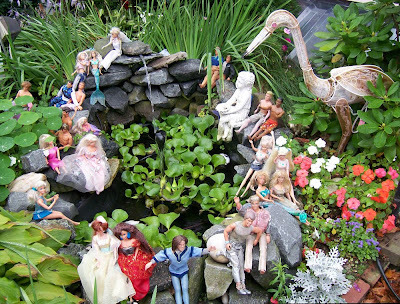 I was cracking up when I saw the Barbie and Ken dolls hanging out at the pond. I thought you set that up for the shot, then I read your comment...too funny. Did you ever find out who posed the dolls there? a kid perhaps? Vivian- I pretty sure it was one of the proprietor's of Romeo's B & B who staged this Ken and Barbie party. sppoklie and funny - and always enlightening....gracias, otra cerveza por favor. gracias, otra cerveza por favor. I wanna lay down on the couch - happy Easter, Andrea. Indoor Easter egg hunt here when Greg and Marie wake up. Poor Alex and Mariana have been up, awake, in their room for an hour. You'd think thery were in Pennsylvania and it was the fierts day of deer hunting season..
Those are both good for this challenge. 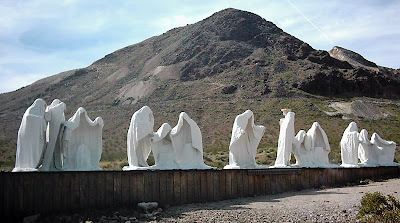 We may be driving through Death Valley. If so, maybe we can see this ghost town. It looks interesting!